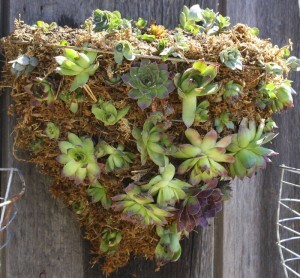 Vertical gardening, green walls and living wall art has certainly become the trend in garden design. Companies like Wooly Pocket, Smith & Hawken, and Elt Living Wall Panels have come out with wall planting systems that allow you to create vertical gardens on indoor walls and the outside of buildings. 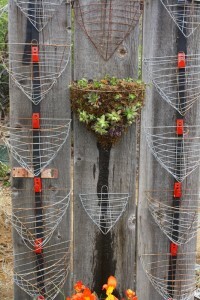 For those that have limited garden space or no planting beds at all you may want to consider vertical gardening. A plain empty wall or fence can instantly be transformed into something beautiful with vertical “wall art”. 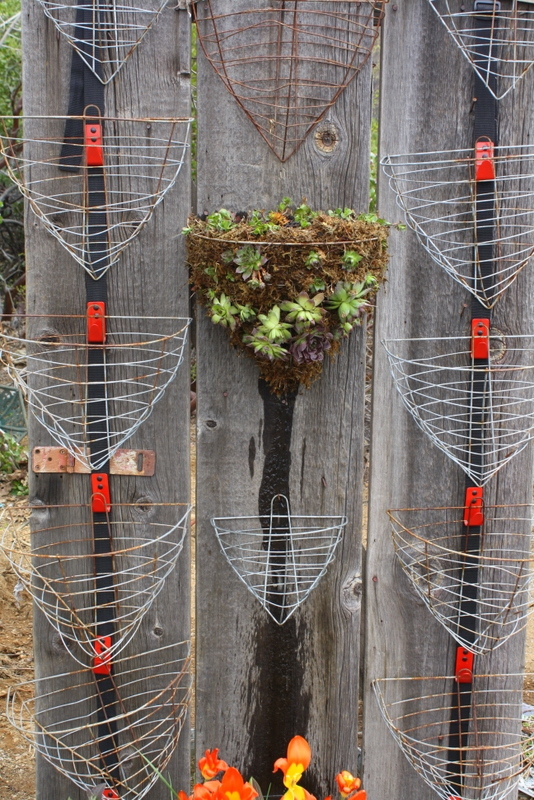 Are you new to vertical gardening? I’m here to tell you that once you get familiar with it you’ll be hooked! 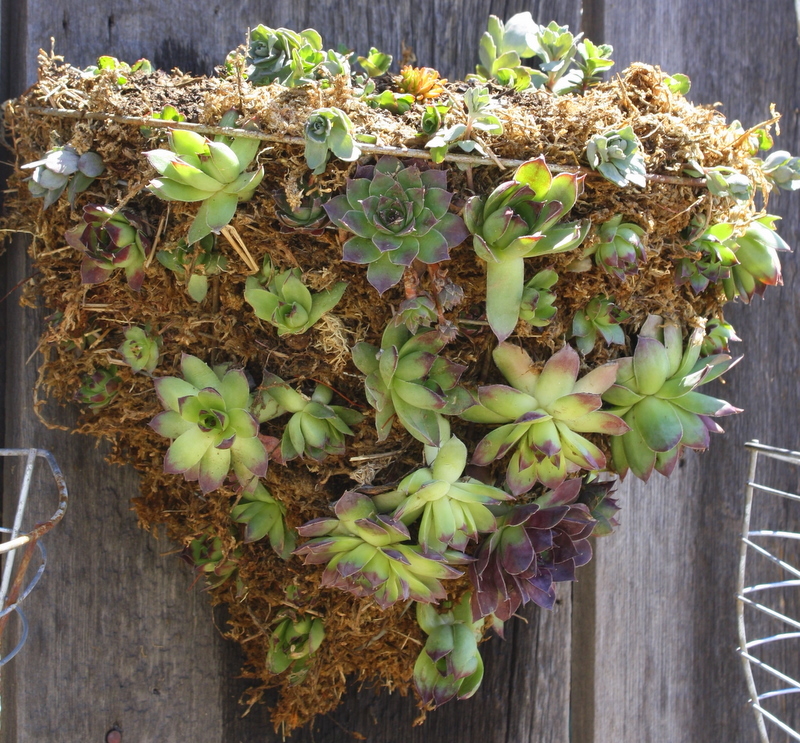 If you have access to free succulents and sedums, this project can be made for under $10. 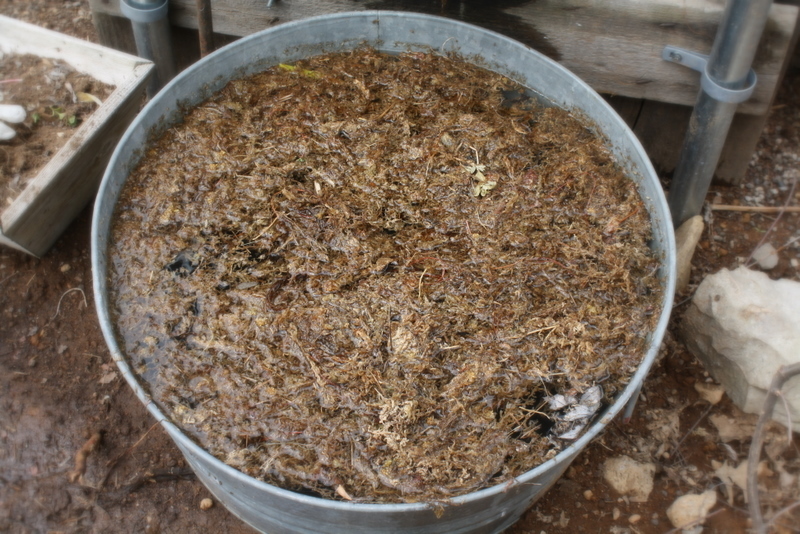 Put on gloves and add sphagnum moss to a bucket, fill with water and let soak for at least 10 minutes. 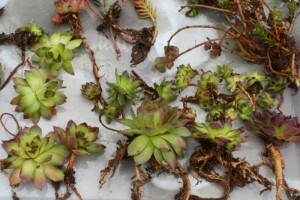 While the moss is hydrating lay out your materials in an assembly line fashion: potting soil, plants, watering can or hose. Hang the wire basket so it will be easier to work with. The basket will become heavy so make sure the nail or screw is firmly attached to a fence or wall. 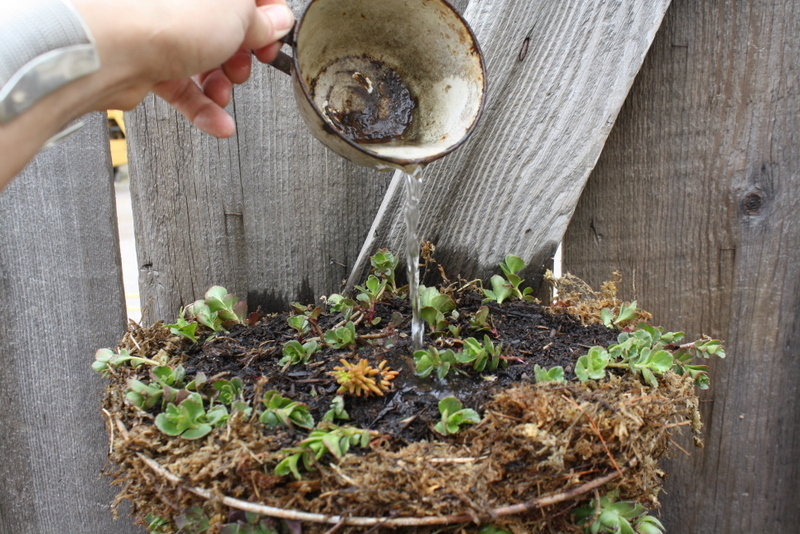 To start your first row, grab a handful of moss and squeeze out the water. Firmly press moss into the bottom, sides and back of the basket. The moss “nest” should be at least two inches thick with no holes or the potting soil may fall out. 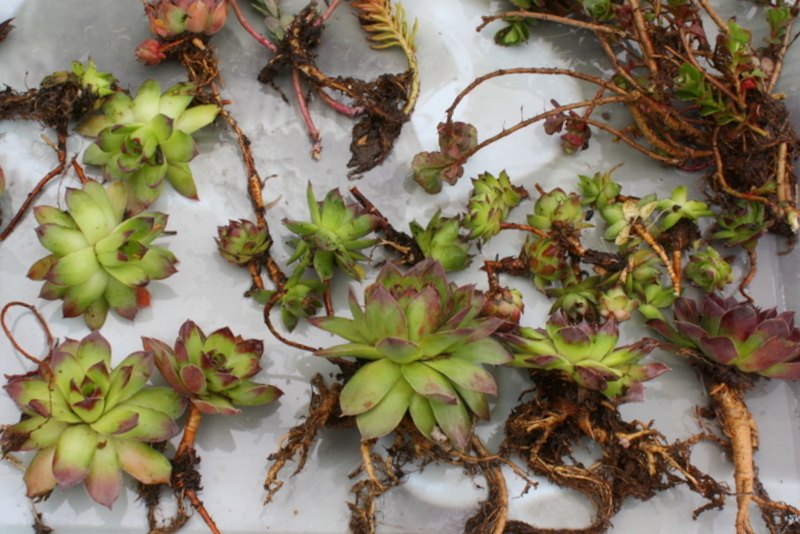 Add potting soil to the moss “nest” and gently plant your first row of succulents. Now, sprinkle with water. Repeat the previous two steps until the top of the basket is completely surrounded in moss. 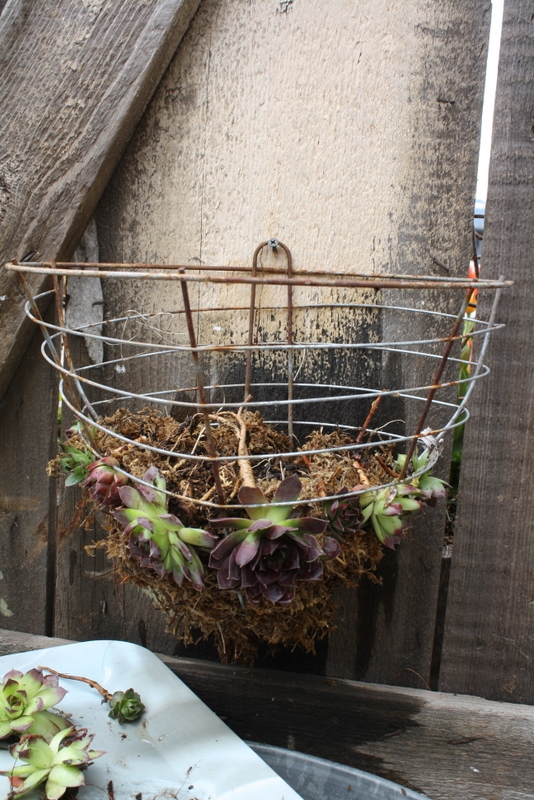 In the top of my basket I planted sedums that will get some height and flowers as they mature. One of my favorites being Sedum Siebolbii. 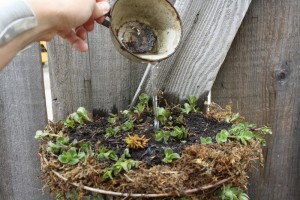 Be sure to water well after planting. You’re done! If you have any questions please feel free to ask! I’m not an expert but I’m more than happy to help in any way I can. I’ve created this blog to share and learn from others so please feel free to post your garden pictures or questions on my facebook page or send them to me via Twitter…I’d love to hear from you! super cute. i always get envious when i look at your gardening fun. as usual, i’m stuck with a few pots on my windowsill. Thank you Forest! Gardening is an addiction for me, I love it! Thank Annie! I’m so happy you stopped by and took a look at what I had growing on. Cool, Nicky! Post pics when you’re totally done! Thanks Jenny! I’ll post pics when it’s finally finished. Thanks for stopping by garden friend. Thanks Jenny! I think I”ll be buying moss instead of booze to finish this project up, lol! Love this idea. Would this work on a metal fence ? Some thing that isn’t solid at the back. Yes, it should work on a metal fence. It may dry out faster since the back will have more exposure, so keep an eye on it. Sometimes I water my basket twice on a hot day. Thanks for stopping by! I have one of these hanging on my fence right now (though I have to admit yours looks nicer than mine right now!). Can’t wait to see pics of ALL of yours planted – what a statement that’ll make! Thanks for stopping by Rebecca! I didn’t like mine at first because it seemed sparse, like there was too much moss showing. 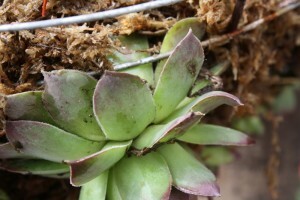 So, with an ice pick (lol), I made several small holes and carefully slide more hens and chicks in the basket. After that it looked better. Love this, Nicky!!! 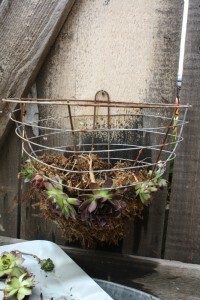 I’m wondering if I can make it even more DIY and use the hog wire I have a roll of – LOL! Be sure to post pics as it fills in. Thanks Genevieve! I have hog wire too…I should give it a try too, haha! This is SO COOL! It looks great!!! 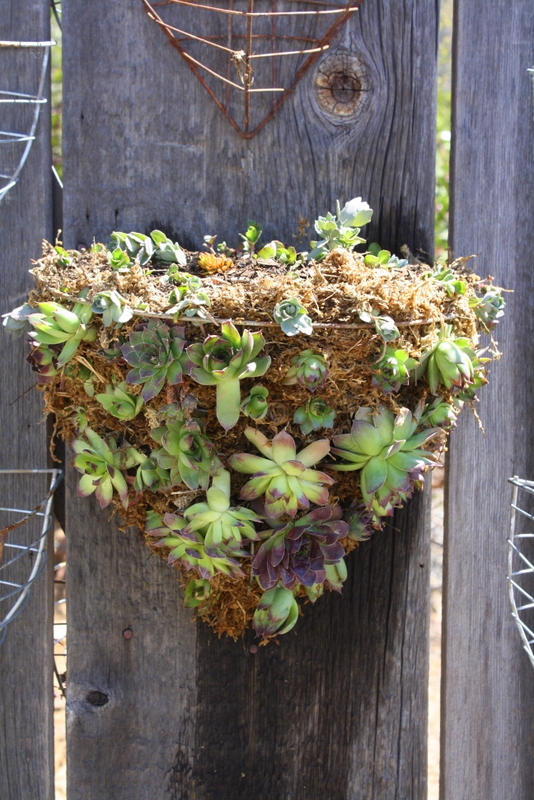 I definitely want to do something cool like this with my succulents. Where did you buy the baskets? Nice! I must try this as I have several empty baskets for a wall.